The BFI has brought the ultra-rare British comedies featuring early Peter Sellers performances Penny Points to Paradise and Let’s Go Crazy to DVD and Blu-ray, in a special edition which includes the little-seen Sellers voiced comic clip collection The Slappiest Days of Our Lives. Featuring celebrated cast members from The Goon Show, and shot on a shoestring budget, these post-war comedies have remained virtually unseen since their original release. Now rescued from obscurity, and painstakingly reconstructed and restored from the best available materials by the BFI National Archive, this eagerly anticipated release constitutes the missing link in British comedy history and charts the very beginnings of Peter Sellers’ extraordinary rise to international stardom. In Penny Points to Paradise (Tony Young, 1951, 68 mins), gormless Pools winner Harry Flakers (Harry Secombe), accompanied by his best pal, Spike (Milligan), head off on holiday down beside the seaside where he hopes to relax and celebrate his new-found riches. Before long, they are confronted by gold-digging gals, dealing with the Goonish Major (Sellers), facing a sassy salesman who won’t take no for an answer (Sellers, again), hula-hula-ing with Felix Mendelssohn and his Hawaiian Serenaders, and tangling with thieves (dryly played by Alfred Marks, and Bill Kerr of Hancock’s Half Hour). Shot on location in and around Brighton, the old-school comic antics on offer here are sure to raise a very British chuckle. Let’s Go Crazy (Alan J. Cullimore, 1951, 31 mins), is a comedy short made immediately after Penny Points to Paradise, Let’s Go Crazy is another fascinating embryonic showcase for British comic legends Peter Sellers and Spike Milligan. This raucous, ramshackle film features improvised Goonish sketches, memorably interspersed with an entertaining selection of variety turns, including Freddy Mirfield and His Garbage Men, Britain’s outrageous answer to Spike Jones and His City Slickers. Taking multiple roles, Sellers excels as Giuseppe, a frustrated waiter exasperated by demands for ‘boiled beef and carrots’, drags up in grande dame style to become the Crystal Jollibottom of his radio comedy days, and – as an anarchic mock-Groucho Marx – blows up the set! The bonus film, The Slappiest Days of our Lives (1953, 73 mins), is an intriguing oddity. Barely seen since its original release, this virtually forgotten French compilation of clips from vintage silent comedies was re-dubbed by Adelphi Films with a flight-of-fancy voiceover commentary by Peter Sellers. Against a backdrop of extracts from classic early comedy films, Sellers stylishly adopts the vocal personae of some of his comic heroes to take a slapstick trip across the USA. Penny Points to Paradise and Let’s Go Crazy are the first titles in a new BFI DVD strand exploring the output of Adelphi Films – a small, family-run British company. Future titles will explore the exciting, yet curiously overlooked, output of this tiny studio, from noir-ish crime pictures and buoyant musicals to colourful melodramas and slapstick comedies. Sid James, Diana Dors, Ted Ray, Petula Clark, Ronnie Corbett, Rolf Harris and Prunella Scales are just some of the many well-loved performers who appeared before Adelphi’s cameras early on in their careers. Both films have been restored by the BFI National Archive thanks to the generous support of Laura Camuti, a Sellers aficionado. They have been re-mastered to High Definition from the BFI’s newly restored film elements. 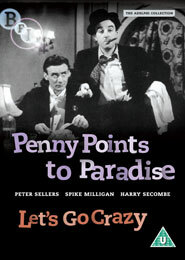 Penny Points to Paradise and Let’s Go Crazy is available now from the BFI, priced £17.99 on DVD and £22.99 on Blu-ray. To read the Wiped news story about these films return from obscurity, click here.